For years, foam has been used as a fire-extinguishing medium for flammable and combustible liquids. Unlike other extinguishing agents - water, dry chemical, CO2, etc., a stable aqueous foam can extinguish a flammable or combustible liquid fire by the combined mechanisms of cooling, separating the flame/ignition source from the product surface, suppressing vapors and smothering. It can also secure for extended periods of time against reflash or reignition. Water, if used on a standard hydrocarbon fuel, is heavier than most of those liquids and if applied directly to the fuel surface, will sink to the bottom having little or no effect on extinguishment or vapor suppression. If the liquid fuel heats above 212ºF, the water may boil below the fuel surface throwing the fuel out of the contained area and spreading the fire. For this reason, foam is the primary fire-extinguishing agent for all potential hazards or areas where flammable liquids are transported, processed, stored or used as an energy source. Before reviewing the merits of the different types of foam concentrates, there are certain terminologies associated with foam that must be understood. FOAM: A fire fighting foam is simply a stable mass of small air-filled bubbles, which have a lower density than oil, gasoline or water. Foam is made up of three ingredients - water, foam concentrate and air. When mixed in the correct proportions, these three ingredients form a homogeneous foam blanket. FOAM SOLUTION: This is a solution of water and foam concentrate after they have been mixed together in the correct proportions. FOAM CONCENTRATE: This liquid concentrate is supplied from the manufacturer which when mixed with water in the correct proportion forms a foam solution. FINISHED FOAM: Foam solution as it exits a discharge device, having been aerated. DRAINAGE RATE: This is the rate at which the foam solution will drain from the expanded foam mass or how long it will take for 25% of the solution to drain from the foam. This is often called the quarter life or 25% drain time. Foam that has a fast drain time is normally very fluid and mobile, spreading across the fuel surface very quickly. While foams with longer drain times are normally less mobile, they move across the fuel surface slowly. EXPANSION RATE: Volume of finished foam divided by the volume of foam solution used to create the finished foam; i.e., a ratio of 5 to 1 would mean that one gallon of foam solution after aeration would fill an empty 5-gallon container with the expanded foam mass. LOW EXPANSION FOAM: Foam aerated to an expansion ratio of between 2 to 1 and 20 to 1. MEDIUM EXPANSION FOAM: Expansion ratio between 20 to 1 and 200 to 1. HIGH EXPANSION FOAM: Expansion ratio above 200 to 1. DILUTION RATE, MIXING RATE, OR PROPORTIONING RATE (correct amount of foam concentrate to be mixed with water): The amount is normally shown on the pail or drum of concentrate. The container will normally display a figure or combination of figures. Normal figures shown are 1%, 2%, 3% or 6% or a combination of 1% and 3%, 3% and 3%, or 3% and 6%. If the container of foam concentrate has 3% shown, it means that for every 100 gallons of foam solution required, 3 gallons of the foam concentrate must be used in the solution with the balance being 97 gallons of water. If 6% were displayed, this would mean that 6 gallons of the foam concentrate would be required to be mixed with 94 gallons of water to form the 100 gallons of foam solution. From the above, it becomes obvious that a 3% foam concentrate is twice as concentrated as a 6% foam concentrate. On the same size and type of flammable liquid fire, half as much 3% foam concentrate would be required than if the 6% foam concentrate had been used. SEAWATER COMPATABLE: Can foam concentrates be used with seawater as well as fresh water? Modern day foam concentrates can be used successfully with either sea, fresh or brackish water. The foam blankets the fuel surface smothering the fire. The foam blanket separates the flames/ignition source from the fuel surface. The foam cools the fuel and any adjacent metal surfaces. Before we review the different types of mechanical foam concentrates, please understand that there are two different basic flammable or combustible fuel groups. Standard hydrocarbon fuels such as gasoline, diesel, kerosene, jet fuel, etc. These products do not mix with water or are not miscible in water, i.e. these products all float on top of water and, for the most part, they do not intermix. Polar solvent or Alcohol type fuels are fuels that mix readily with water or are miscible in water. It is imperative that when you are preparing to fight a flammable liquid fire, you identify which fuel group the involved flammable liquid belongs. This is necessary, as some foam concentrates are not suitable for use on the Polar solvent/Alcohol type fuel spills or fires. Following is a list of mechanical foam concentrates that are the most common types currently used by fire fighters today. AFFF generated foams extinguish hydrocarbon flammable liquid fires the same way as the protein or fluoroprotein foams; however, there is an additional feature. An aqueous film is formed on the surface of the flammable liquid by the foam solution as it drains from the foam blanket. This film is very fluid and floats on the surface of most hydrocarbon fuels. This gives the AFFF unequaled speed in fire control and knockdown when used on a typical hydrocarbon spill fire. In certain circumstances, it is possible to notice the fire being extinguished by the "invisible" film before there is complete foam blanket coverage over the surface of the fuel. AFFF foam solutions can be applied to a flammable liquid fire using either aspirating or non-aspirating discharge devices. The difference between the two is that the air-aspirating device entrains air and causes it to mix with the foam solution within the device. The non air-aspirating device is incapable of this process. The AFFF/Water solution requires relatively low energy input to expand the foam solution into an expanded foam mass. AFFF foam solutions are unique in that in addition to forming an expanded foam mass, the liquid that drains from the blanket has a low surface tension, which gives it the ability to form the aqueous film that floats on the fuel surface. When flow rates and pressures are similar, AFFF solutions used with a non air-aspirating discharge device will generally discharge/throw the foam a greater distance than the foam that is discharged from the air-aspirating discharge device. A non-aspirating AFFF will generally extinguish a low vapor pressure fuel spill fire slightly faster than the foam discharged from an air-aspirating device. This is because the non- aspirated nozzle generated foam has a lower expansion and will be more fluid; therefore, it will move faster across the fuel surface. AFFF foam solutions are unique in that in addition to forming an expanded foam mass, the liquid that drains from the foam blanket has a low surface tension, which gives it the ability to form the aqueous film that floats on the fuel surface. When using AFFF foams, application technique is not as critical as with Proteins or Fluoroproteins. AFFF foam can also be used successfully with the sub-surface injection method. NOTE: The sub-surface method of discharging foam into a storage tank can only be used with tanks that contain standard hydrocarbon fuels NOT polar solvent/alcohol type fuels. The recommended application rate for AFFF 3%- 6% generated foam solution on a hydrocarbon spill fire with low water solubility is .10 gpm/sq. ft. Remember the protein and the fluoroprotein foam solutions require an application rate of .16 gpm/sq. ft.
AFFF is suitable for use in a premix state and is suitable for use with dry chemical extinguishing agents. ALCOHOL RESISTANT-AQUEOUS FILM FORMING FOAM (AR-AFFF): AR-AFFF’s are available in a 3%-6% type or 3%-3% type concentrate. Flammable liquids that readily mix with water are a more difficult fire to extinguish as opposed to a hydrocarbon fire. Polar solvent/alcohol liquids destroy any foam blanket that has been generated using standard AFFF or fluoroprotein type concentrates. Water in the generated foam blanket mixes with alcohol causing the foam blanket to collapse and disappear until the fuel surface is completely exposed again. To overcome this problem, AR-AFFF type concentrates were developed. Using plain AFFF concentrate as a base material, a high molecular weight polymer is added during the manufacturing process. When AR-AFFF is used on a polar solvent fuel fire, the polar solvent fuel tries to absorb water from the foam blanket. A polymer precipitates out forming a physical membrane/barrier between the fuel surface and foam blanket. This barrier now protects the generated foam blanket from destruction by the alcohol fuel. AR-AFFF concentrates are very viscous. Initial impression of this type of foam concentrate may lead one to believe that the concentrate has “gelled” and somehow gone bad. However, a thick, gel-like appearance is normal. This appearance is caused by the presence of polymers, which are the main components required for polar solvent applications. Modern AR-AFFF concentrates are designed to work through proportioning equipment such as in-line eductors, bladder tanks and balanced pressure pump systems. AR-AFFF 3%-6% type of concentrate is designed to be used at the 3% application rate when used on a standard hydrocarbon fuel fire and 6% when used on a polar solvent/alcohol fuel. Current 3% AR-AFFF type concentrate is designed for 3% application on either type group, i.e. 3% on hydrocarbons and 3% on polar solvent fuels. When AR-AFFF is used at the correct proportioning rate on hydrocarbon fuel, fire fighting performance and application rate are the same as for standard AFFF agents. An “invisible” film is formed, the speed of covering a fuel spill with the foam blanket is similar and the application technique using either air-aspirating or non air-aspirating nozzles can be used. When used on an alcohol fire, an air-aspirating nozzle will give a better performance over the non air-aspirating nozzle. The increased expanded foam mass generated by the air-aspirating nozzle will give a more gentle application onto the surface of the alcohol liquid fire than will the non-aspirating nozzle. The intensity of the fire, distance the foam must be thrown, and the application rate also play an important part in determining the type of nozzle and method of extinguishment. The application technique and performance factors are the same for both the 3% and the 3%- 6% types of AR-AFFF concentrates. SYNTHETIC/DETERGENT (High Expansion) FOAM CONCENTRATE: Normally used at a concentrate rate between 1.5% to 2.5%, this type of foam concentrate is manufactured from a combination of hydrocarbon surfactants and solvents. High expansion foam solution is normally used through devices that give high expansion ratios such as the medium or high expansion type foam generators. In areas such as a basement, mine shaft or a ship's hold where volume fire control is required, a high expansion foam generator can be used to fill an entire room with large amounts of very light expanded foam bubbles. Depending on the generator being used, high expansion ratios of 400 to 1 up to 1,000 to 1 can be achieved. Fire control and extinction is achieved by rapid smothering and cooling. Fires involving solid material as well as flammable liquids can be controlled and extinguished using high expansion foam. It also has a special value for dealing with spillages of liquefied natural gas (LNG). A deep layer of 500 to 1 expanded foam will provide a thermal insulation barrier around the LNG spill, which reduces the heat intake, and therefore the rate of evaporation is decreased. Because of the high expansion ratios being achieved, there is very little water used; even with large discharges of the high expansion foam. High expansion foam has little water content within the bubble wall making it very light and not suitable for outdoor use. Medium expansion foam normally has an expansion of around 50 - 60 to 1. This foam is denser and can be used outdoors but is still affected by weather conditions. CLASS “A” FOAM CONCENTRATE: This is a biodegradable mixture of foaming and wetting agents. When mixed in correct proportions with water, it can change two properties of the water. Class “A” foam will increase wetting effectiveness, which allows for greater penetration into Class “A” fuels. It also gives water a foaming ability, which allows water to remain and cling to vertical and horizontal surfaces without run off. This allows water to absorb more heat. By adding a small quantity of a Class “A” foam concentrate into a water stream, the effectiveness of the water can be increased up to 5 times. WETTING AGENT: This type of agent is very similar to Class “A” Foam with regard to increasing wetting effectiveness of the water but does not have the foaming abilities. FLUOROPROTEIN FOAM CONCENTRATE: Available in either a 3% or 6% type of concentrate. This product is manufactured using the same method as Protein but with the addition of fluorocarbon surfactants. The addition of these surfactants in the concentrate improves the performance of fluoroprotein foam over protein foam in two areas. It makes the fluoroprotein foam more resistant to fuel contamination/pickup and makes the foam blanket more mobile when discharged onto the flammable liquid. Because the fluoroprotein foam is more resistant to fuel contamination, it allows the discharging foam to be applied directly to the fuel surface and the foam blanket will not become as saturated by fuel vapor. This type of foam can be used with a High Back Pressure Foam Maker by utilizing the sub-surface method of forcing expanded foam into the base of a cone roof storage tank containing a hydrocarbon fuel. The expanded foam enters the base of the storage tank then floats up through the flammable liquid to the surface where it covers the surface with a foam blanket. Fluoroprotein foam is sometimes used in the hydrocarbon processing industry for storage tank fire fighting. It is necessary to use with air-aspirating discharge devices. The recommended foam solution application rate on hydrocarbon spills is .16 gpm/sq. ft.
FILM FORMING FLUORO-PROTEIN (FFFP): FFFP is a derivative of AFFF and fluoroprotein. These concentrates are based on fluoroprotein formulations to which an increased quantity of fluorocarbon surfactants has been added. FFFP concentrates were developed to obtain the quick knockdown of AFFF with the added burn back resistance of standard fluoroprotein foam. It appears that the FFFP concentrate performance factor lies somewhere between AFFF and fluoroprotein. FFFP concentrates do not have the quick knockdown of the AFFF’s when used on a spill fire such as an aircraft crash or a highway spill. When used on fuel in depth fires they do not have the burn back resistance of fluoroprotein. FFFP foam can be generated with either air-aspirating or non air-aspirating nozzles. When used through a non air-aspirated nozzle they do not provide expansion ratios as good as AFFF when used through the same type of nozzle. The application rate is .10 gpm/sq. ft. when used on a hydrocarbon spill fire. PROTEIN FOAM CONCENTRATE: Available in either a 3% or 6% type concentrate. This type of concentrate is based on hydrolyzed protein, foam stabilizers and preservatives. It will produce highly stabilized air foam. Protein foam must always be used with an air aspirating type discharge device. Protein foam can become contaminated with fuel if plunged directly onto the fuel surface; therefore, the application technique for Protein foam is quite critical. The foam should be applied as gently as possible to the flammable liquid surface. The application rate for Protein foam solution on a hydrocarbon spill fire having low water solubility is .16 gpm/sq. ft. Protein foam, because of its stability, is relatively slow moving when used to cover the surface of a flammable liquid. SHELF LIFE: Shelf life is the term used to describe the length of time which foam concentrates remain stable and usable without a significant change in their performance characteristics. The shelf life depends upon the composition of the concentrate, the ambient temperature storage range encountered, the container materials and if the concentrate is stored in its original container. A shelf life of 20- 25 years is possible if the standard AFFF, ARAFFF and other synthetic type agents are stored within the manufacturer’s guidelines, temperature limits and in the original shipping container. Protein based foam concentrates are not totally synthetic and have a naturally occurring product in their formulations. If these products are stored within the manufacturers’ guidelines including temperature limits and in their original shipping container, a shelf life of 10 years or more can be expected. COMPATIBILITY: Compatibility is the ability of one foam concentrate to be mixed with another concentrate of the same type and proportioning ratio without altering the chemical, physical or performance characteristics of the mixed foam concentrates. All foams are compatible when applied on a fire simultaneously. foam concentrates have been found to be compatible with most other foam concentrates of like quality and type. does recommend a compatibility study to be made to determine the quality of the concentrate with which the concentrate is to be mixed. AFFFs that are manufactured to the latest revision of Mil-F-24385 specification are mutually compatible by definition. ENVIRONMENTAL IMPACT AND TOXICITY: Contemporary U.L. listed or Military specification approved foam concentrates are specifically formulated to provide maximum fire fighting capabilities while at the same time providing minimal environmental impact and human exposure hazard. All concentrates are readily biodegradable both in the natural environment and in sewage treatment facilities. products are also formulated to have very low fish toxicity. The concentrates are not considered primary or secondary skin irritants; however, prolonged contact may cause some dryness of the skin since they contain detergents. recommends that areas of the skin, which have come in contact with the concentrate, be flushed with fresh water. If any dryness of the skin is experienced, a good quality hand cream should be used to replenish the moisture in the skin. Firefighting foam has been around for a long time. 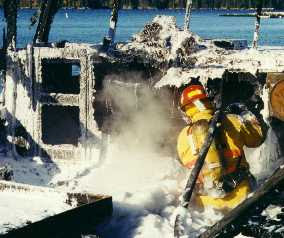 The Navy, ARFF firefighters, and the petrochemical industry have used Class B foams for decades. When used properly, foam does a good job of extinguishing fire types for which water is not an efficient extinguishing media. 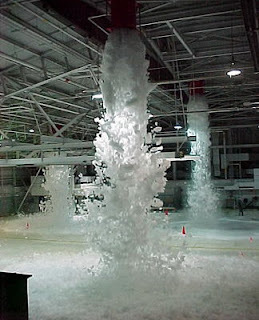 Foam can be used on Class A fires, Class B fires, and for hazmat vapor suppression. Class A foams are designed for one thing – fighting structural or woodland fires where the fuels are solid and have no special hazards. 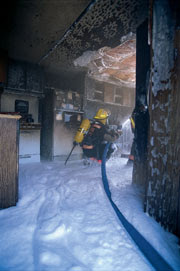 Class A foam does an excellent job of sealing air away from fuels and often result in less fire damage to a structure. Class A foams are very efficient at one thing, but they are a one-trick pony. 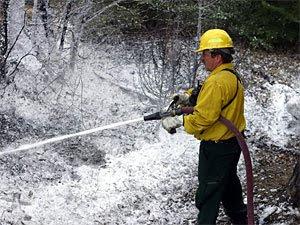 Class A foams are useful as wildland fire barricades or for direct structural fire attack. However, Class A foams don’t produce much steam, so they are very ineffective when indirect fire attack is required, as in an attic fire. CAFS is Class A foam that has air bubbles mechanically added at the pump so that the hoseline is pumping finished foam rather than foam solution. It makes the hoselines lightweight and easy to handle. It also makes the hoselines much easier to kink and completely shut off the foam flow than either water or Class A foam lines. Class A foam is high maintenance – it requires a compressed air pump in addition to the water pump. Protein Foams are designed for Class B liquid fires. They are old school, having been around since World War II. Protein foams are made from either animal blood and byproducts, from soybeans, or from a combination of both. They may have fluorine added to increase shelf life, but the fluorine adds environmental toxicity to the foam. AFFF is a Class B foam that creates a vapor suppressing film between the foam bubbles and the fuel surface. It is very effective on spill fires. It is good to great at sealing flammable vapors into liquid fuel spills. The AFFF film is slick and oily. Applying other Class B foams atop AFFF usually results in the other foam sliding away due to the slickness in the AFFF. AFFF is good for suppressing polar solvent (alcohol) fires, but it requires twice as much concentration (6%) for this application as the normal (3%) application rate needed for hydrocarbon spill fires. AR-AFFF is a new foam type that is similar to the older AFFF, but with several important differences. AR-AFFF is around 50% more expensive than standard AFFF. However, it is applied at 1% to hydrocarbon spill fires and 3% to polar solvent fires, so a given quantity of AR-AFFF will suppress three times as much fire as an equal quantity of standard AFFF. This results in an actual decrease in cost-per-gallon of the foam concentrate. Typical AR-AFFF is completely biodegradable, and is manufactured without the fluorine additives common to AFFF and protein foams. That makes it a much better choice for fighting both hydrocarbon and polar solvent fires. Additionally, AR-AFFF can be mixed at 0.5% and used as Class A foam for both wildland and structural firefighting applications, making it the most flexible foam currently available? High Expansion Foam is designed to fill up confined spaces and exclude fire. It does not perform well in exposed positions, because its high expansion ratio makes it light, fluffy, and easy to blow away in a light wind. High expansion foam applications are so limited that most public fire departments don’t even carry it. High expansion foams require special application devices. They also require a lot more effort than conventional foams in order to be effective. 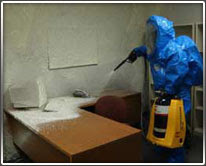 Hazmat Foams are designed to suppress vapors from liquid hazmat spills. They are usually not effective for firefighting in Class A, Class B, or polar solvent fires. They are very, very good for one thing – preventing vapors from rising up from below. In this respect, hazmat foams are even more specialized and limited than is traditional AFFF. Hazmat foams are very effective not only at keeping vapors from entering the environment, but they are effective at keeping the environment out of the hazmat spill. Write Your answer: 6+9= Math Captcha. R-363 ,Rabale M.I.D.C,TTC Industrial Area, New Mumbai-400701.